Author adminPosted on July 16, 2009 Categories Browser Tools, Linux, Software ReviewsTags chrome OS, google chrome, Linux, microsoft, WindowsLeave a comment on Google Chrome OS – Boon or Bust? 5 Reasons Why the World Still Uses Windows – Can Linux Ever Catch Up? The world still uses Windows. Where did Linux go wrong? Can it be corrected? Let’s throw out the Linux evangelical hat for the moment. The fact is, despite the growth in installed Linux OS on servers and some low end desktops, most of the world still is still using Windows. Where has the Linux failed so far? If the Linux argument is so strong then why has the majority of the world stayed with Microsoft Windows? 1. Pain vs. Simplicity. The perceived value of Linux as a general desktop solution isn’t there yet. The average computer user is still very non-computer literate. They want to go with what they know. A computer for most users is a means to an end. A place to check email, browse the web, maybe work on some spreadsheets, and use whatever software their work installed and trained them to use. Linux is perceived still as the painful solution. The OS that requires guys with pocket protectors to stand next to you while you install and make sure everything turns out ok.
2. Linux has too many flavors, too many options. For most desktop users, there’s one Windows choice. XP begat Vista, which will beget Windows 7. That’s it. Meanwhile, there are many dozens of Linux distro choices each with several desktop environment options, and a seemingly never-ending list of possible apps to install. True, Ubuntu and Suse have done alot to dispel the Linux is a geek’s game only notion. Top-shelf open source products like Open Office, Firefox, Gimp, and Thunderbird, to name a few, have made open source mainstream. Still, there’s a lot of work to be done in bringing all the myriad of options to a more standardized package to select. 3. There’s no CTO of Linux. Linux has many chiefs, but no executive chiefs. There’s no single person, or even body, that’s taking the responsiblity of charting the strategic course of Linux as an OS. Yes, there are major organizations like KDE that do have standards, and of course many will argue that’s the whole point of Linux, no corporate body to man-handle the direction. But maybe that’s what Linux needs. We are all off in so many neat directions, but there’s not a cohesive mainstream. Even within Ubuntu, the challenger for ‘head distro’, there is Kubuntu, Edubuntu, Xubuntu, etc… Each of these sub-distros act like separate bodies. They even have their own websites. 4. Quality vetting of programs on Windows vs. Linux – I’m not kidding. Yes, Microsoft is the major abuser of releasing beta code as a finished product. But so does the Linux crowd. Let’s face it, there are many programs in Linux that simply don’t work with all the appliances or hardware that you have installed. Windows, with it’s closed-source SDK gives developers one framework with which to develop on. The level of quality from one app on a distro to another can vary greatly. Whereas on Windows, they all more or less are at the same level of quality. 5. OEM Software – Why does the iPhone kick every other smartphone on the market? Because they have 50,000 (and counting) software apps developed to work on it. When you buy a scanner, camera, printer, or any other peripheral, what are the chances that included with the device will be a Linux version of their proprietary software? When a consumer buys a Nikon Camera, or a Canon Scanner, they want to use Nikon’s or Canon’s software that came with the box. It’s part of the cognitive dissonance of afirming that the right product was purchased. You and I know that Linux can most-likely handle everything that these OEM apps do, and sometimes better (Kooka rocks), still 90% of the computer users out there don’t want to hassle. What can be done? In my next instalment, I’ll offer some suggestions. Please share your thoughts and comments as well. Author adminPosted on June 25, 2009 June 25, 2009 Categories LinuxTags kde, linux vs. windows, microsoft, open source, ubuntu, windows vs. linux13 Comments on 5 Reasons Why the World Still Uses Windows – Can Linux Ever Catch Up? Today’s top stories with TechExposure’s unique commentary. China presses on with its plans to monitor every piece of information passing thru Chinese computers. Can anyone say “Big Brother”? There’s a few interesting threads in the papers today regarding the value of an iPhone and the sum of its parts. Are you still confused? Further consolidation of the gaming industry as one big gaming company buys another. It’s a good thing that industry hasn’t figured out they could go to congress and ask for bailouts. Hey, there are probably thousands of programming jobs at risk here. Did we read that headline correctly? 5 Million TVs! What ever happened to USA TV Manafucterers like Zenith? Remember their slogn, “the quality goes in before the name goes on”? It’s no wonder that the US is starting to aggressive in its trade restrictions. Now developers of mobile ads can bake in Google Adsense ads. The hegemony continues! Remember when “Microsoft Security” was considered a oxymoron? According to their website, the Microsoft Security Essentials (MSE) Beta reached 75,000 downloads in less than 24 hours. 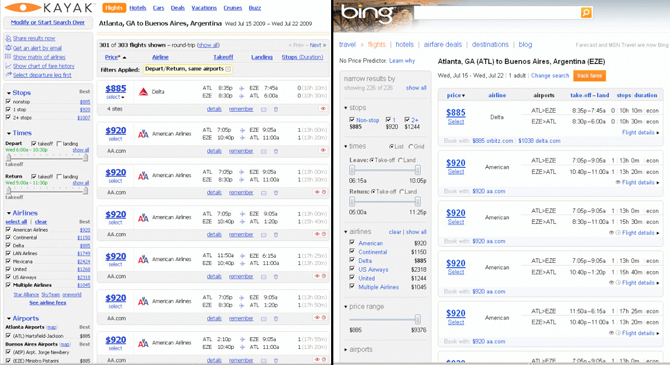 Kayak to Bing: Stop Copying Us! File this one in the ‘duh’ department. Fortune Magazine reports that of the 100 CEOs interviewed, none are maintaining a blog, and only two have a Facebook page.